The Association for the Advancement of Creative Musicians (AACM) is a non-profit organization, founded in Chicago in May 1965 by Muhal Richard Abrams, Jodie Christian, Steve McCall and Phil Cohran. Early members included Henry Threadgill, Anthony Braxton, Jack DeJohnette, Chico Freeman, Wadada Leo Smith, Leroy Jenkins and Art Ensemble of Chicago: Lester Bowie, Roscoe Mitchell, Joseph Jarman, Famoudou Don Moye and Malachi Favors. In the 1960s and 1970s AACM members were among the most important and innovative musicians of the period. The musical endeavors of the AACM include an adventurous mixing of avant-garde jazz, classical, and world music. AACM had a strong relationship with an influential sister organization, the Black Artists' Group (BAG) of St. Louis. 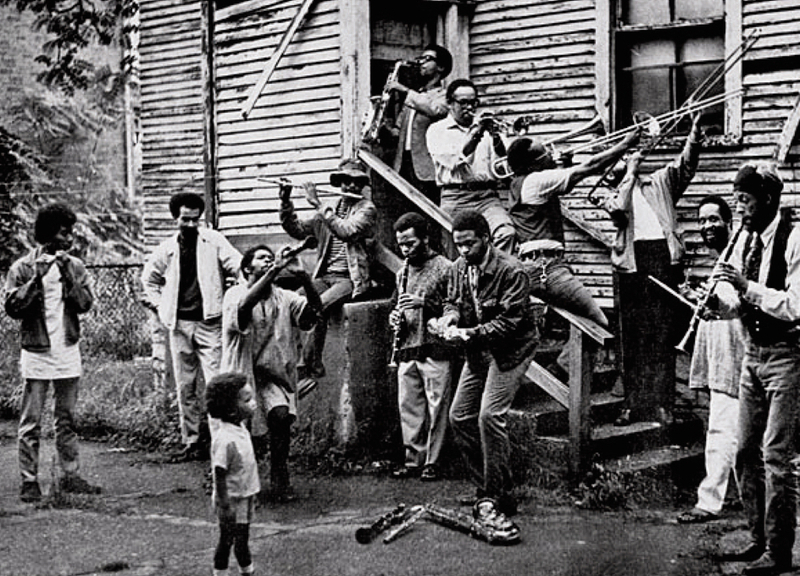 The picture was taken in front of photographer studio with members of AACM and 30 month old son, Wadsworth Jr.
Muhal employed me to shoot some photographs for a brochure that would contain publicity for the AACM. At that time I think they had a contract with Delmar Records to cut a record or album. The AACM choose one photo for their brochure and paid for the photo shoot and the one chosen for their brochure. People left to right in photo on the first level: Wadada Leo Smith: composer, trumpeter, educator and flute player; Sarnie Garrett: composer and guitarist; Muhal Richard Abrams: composer, pianist, clarinetist co-founder of AACM and educator; Wallace McMillian: composer, musician, craftsman, congo player and educator; Douglas R. Ewart: composer, musician, craftsman, visual artist and educator; John Stubblefield: composer, saxophonist, flutists, clarinetist and educator; Stephen McCall IV: composer, drummer, educator and co-founder of AACM; Henry Threadgill: composer, musician and educator. On stairs starting at the top: Buford Kirkwood: composer, reeds and educator; John Shenoy Jackson: trumpeter, administrator and educator; Lester Lashley, trombonist, bassist; visual artist, craftsman, trombone and banjo and Martin "Sparks" Alexander: musician, engineer and accountant.